Jim Pringle – of the National Weather Service in Grand Junction, Colorado contacted an Eagle County based, ECT contributor this week. Jim is a ‘Warning Coordination Meteorologist’ based in Grand Junction and was instrumental in installing and testing of Eagle County’s own National Weather Service – Weather Radio – transmitting on 162.450Mhz from the top of Castle Peak in Eagle, Colorado. SmartPhone users can also listen to that NOAA Weather Radio -anytime via the FREE “NOAA Radio” app – after downloading and installing just look for the ‘Eagle Weather Radio’ stream when you first configure it! Of the (many+1) topics covered by Jim Pringle last week – Jim advised is that “since Eagle County is above the 90 degree east marker” – of his NEXRAD Radar (WSR-88D) Eagle County enjoys much more accurate Weather Radar picture of the current ‘Rain/Storm’ cells. Below (actually >90 degrees east) the Radar doesn’t perform as well as NOAA would like. 1/2 of a degree of ‘skip’ off a few mountain peaks near the Crested Butte, Montrose Region of Colorado – is enough to challenge the performance/quality of the Radar images from that area! 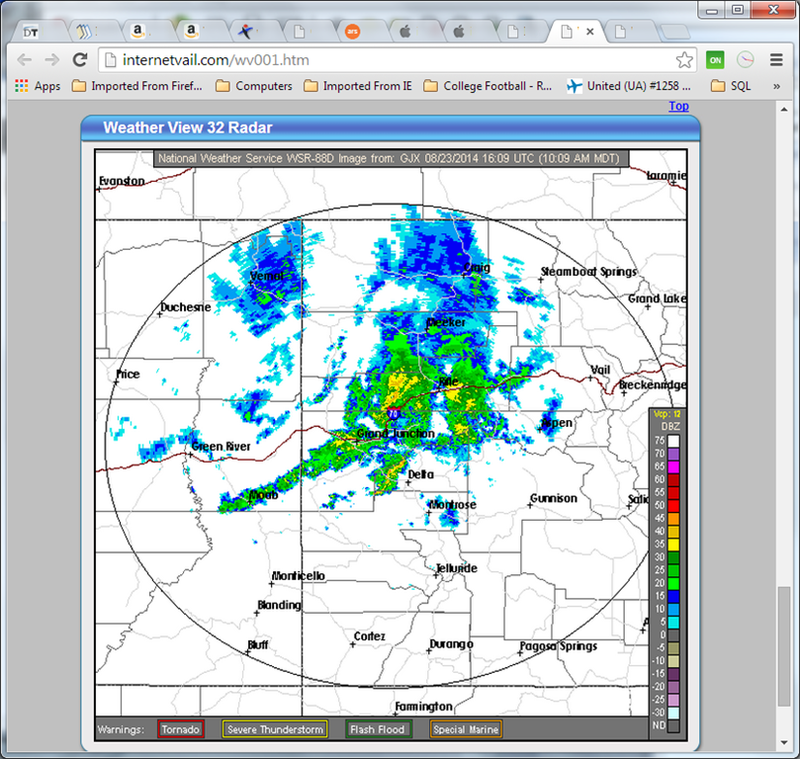 You can see the current NEXRAD WSR-88D Radar image by (Clicking Here) and scroll down to the bottom of that web page. Side Note: This WSR-88D Radar is located on the top of the Grand Mesa (10,000 ft.) in Grand Junction, Colorado. (Click Here) for the current webcam image from that Radar site! The EagleCountyTimes.com folks are happy to assist Jim and his NWS team in Grand Junction, Colorado on their stated mission of “Building a Weather-Ready Nation”. For us here at the ECT – is all about improving Public Safety for everyone.